A superb choice of great value Hotel With Dinner Deals in the UK from Greatest Gifts. Also, please have a look at our short break special offers on Dinner, Bed and Breakfast Deals in the UK. Hotel with Dinner Deals in the UK. A short break in the UK doesn't need to be really expensive. Please check out our huge selection of hotel with dinner deals in the UK. Greatest Gifts have hundreds of offers from leading retailers all here on one website meaning you don't need to surf the internet to get a great deal. Simply compare the offers and make your selection, then click to go to the retailer of your choice and supply all your details. We can save you lots of precious time and hopefully save you money as well! There are hundreds of hotel with dinner deals to choose from so we have complied a short list of a few popular offers. A night for two in lovely Cumbria. The Hallmark Hotel with dinner deal is a great value package that won't break the bank. This is a great Carlisle inner city two-course dinner bed and breakfast deal that is convenient to the Eden Valley, the North Pennines and the Yorkshire Dales. The Crown Inn is located in the lovely Clun Valley (an official Area of Outstanding Natural Beauty) in Shropshire and offers fantastic hotel with dinner deals. Relax and enjoy a lovely three course dinner and wake refreshed to get tucked into a full English breakfast in the morning. One of our great value hotel with dinner breaks in the UK. 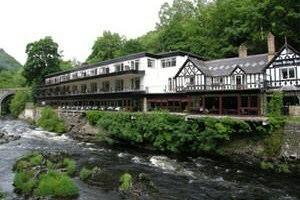 The Chainbridge Hotel with dinner deal is another superb offer. Overlooking the River Dee, this is a lovely location for an overnight break for two with dinner and breakfast included. There are historic attractions and wonderful scenic Welsh locations to explore nearby. This lovely hotel boasts great character and luxurious comfort. A delightful place to stay on one of the many hotel with dinner breaks in the UK. Dumbleton Hall Country House Hotel is set in nineteen acres of private gardens in the beautiful Worcestershire countryside. This 19th century Country House Hotel offers guests superb scenic views and a luxurious stay in a welcoming atmosphere. The Cedar Restaurant is the lovely location for a beautiful three course dinner and for a hearty breakfast the next morning. A superb hotel with dinner break for two.